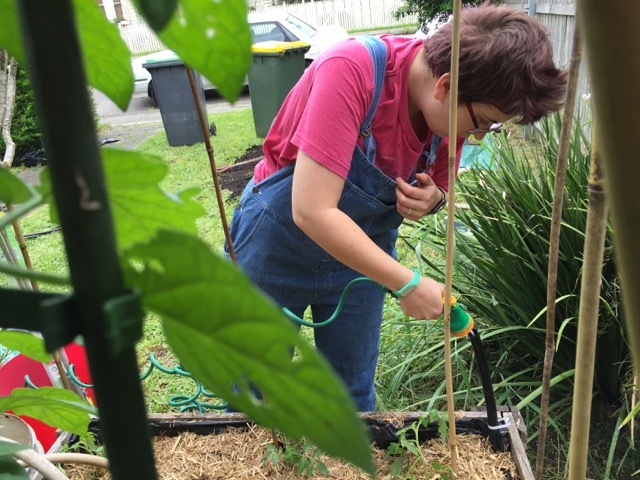 I was inspired to read about wicking garden beds and their suitability for the Australian veggie garden. 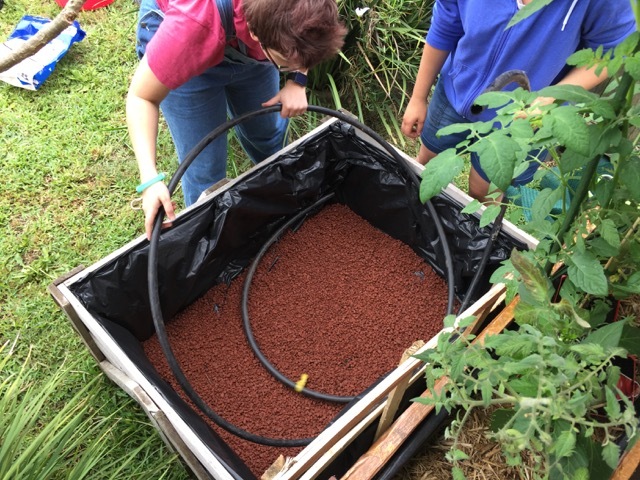 Basically, wicking garden beds have a water ‘tank’ under the soil, with the water rising up (wicking) through the organic soil matter to the plant roots. They are ideal for our hot climate and require less watering during summer when compared with normal watering. I had guest handywoman and elite builder, Sarah, on hand for a bunch of handywoman type activities today. Although you could build this yourself, having an extra set of hands certainly speeds things up! 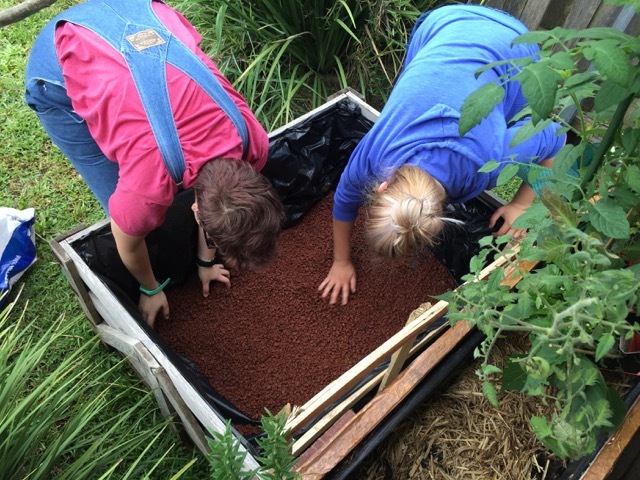 I would recommend setting aside at least half a day to make your first wicking bed. 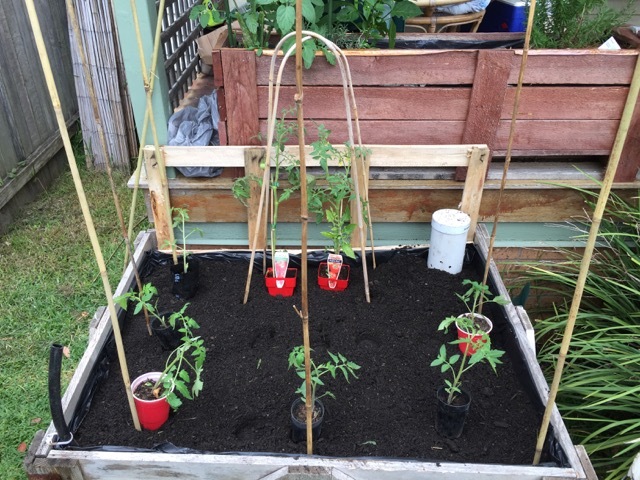 I have decided to fill mine with tomatoes, inspired by my brother-in-law Michael’s tomato square. 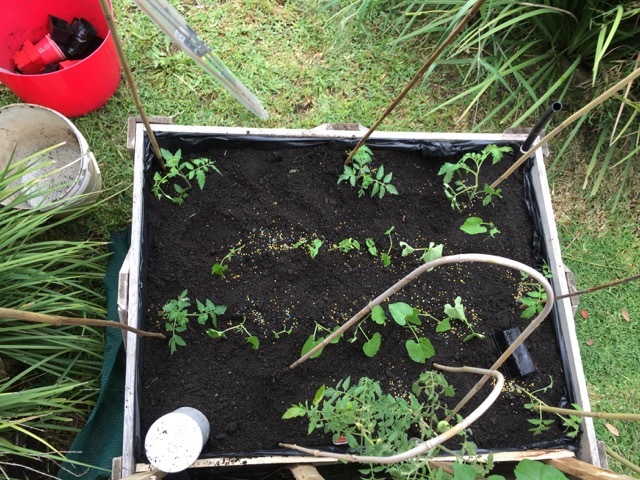 I also added a home-made worm farm to allow the garden to “feed” itself. 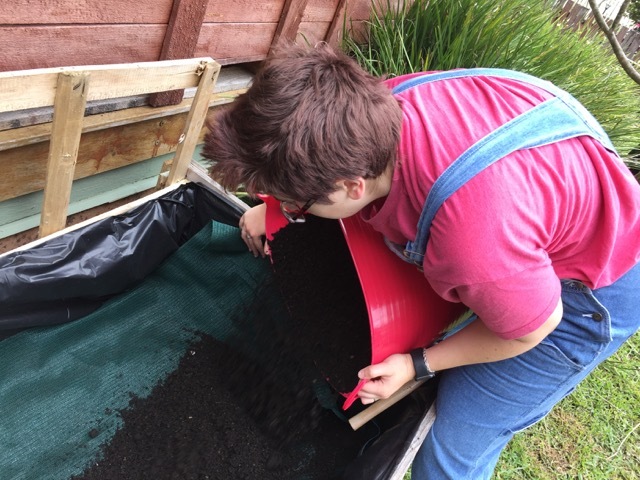 By adding compost waste to the worm farm, we are reducing our normal waste output and allowing the worms to turn this into garden fertiliser. Gather all the things you need! 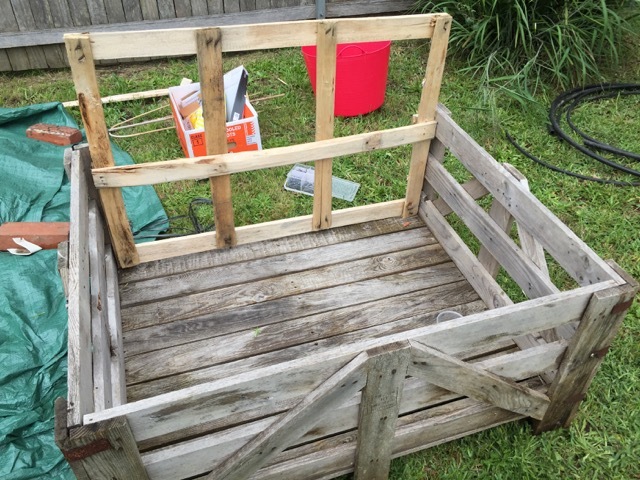 Build your DIY Raised Garden Bed. 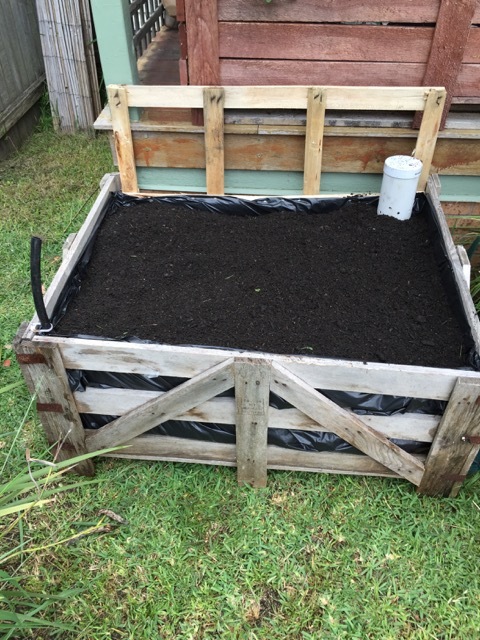 We were able to use an old pallet, combined with wood from a furniture shop (found on Gumtree). 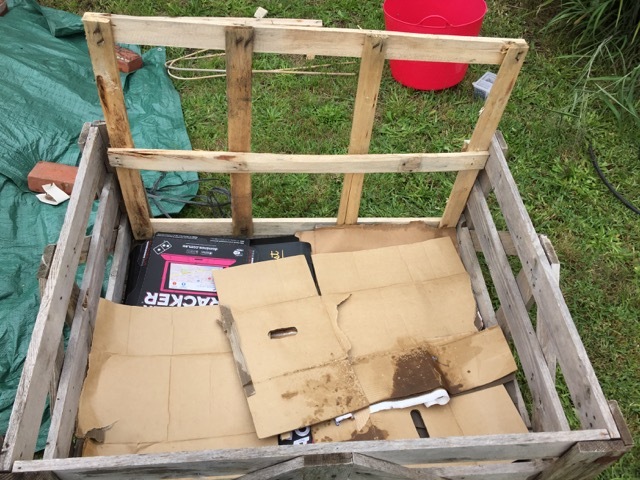 This pallet already had a solid base and just needed some strengthening. 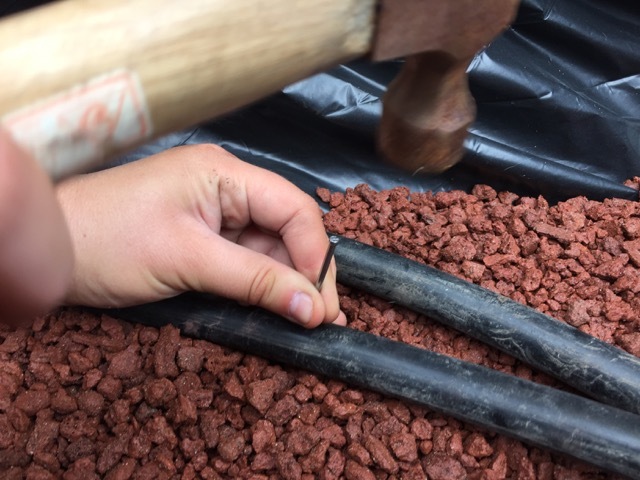 Make sure all the nails are hammered in – you don’t want to puncture your water basin! Line the bottom of the bed with cardboard to prevent damage. Double line your bed with builders plastic. We used an electric staple gun to secure the top edges. This needs to retain water so make sure you allow it enough give. It is a good idea to move the bed into location before the next steps; it will become very heavy! 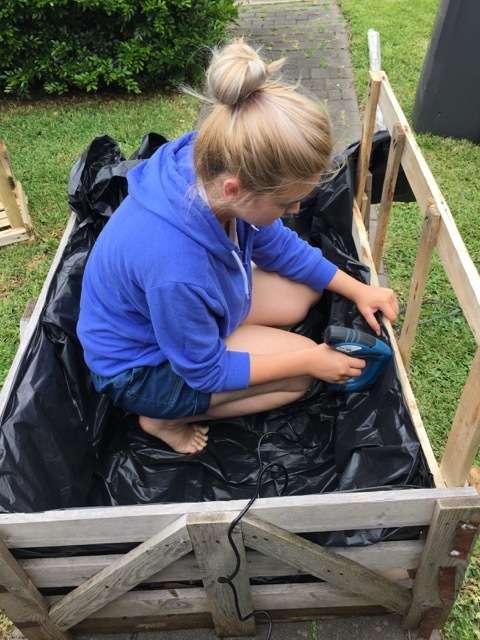 Make sure your garden bed is very level. We propped up one side of ours with a brick. 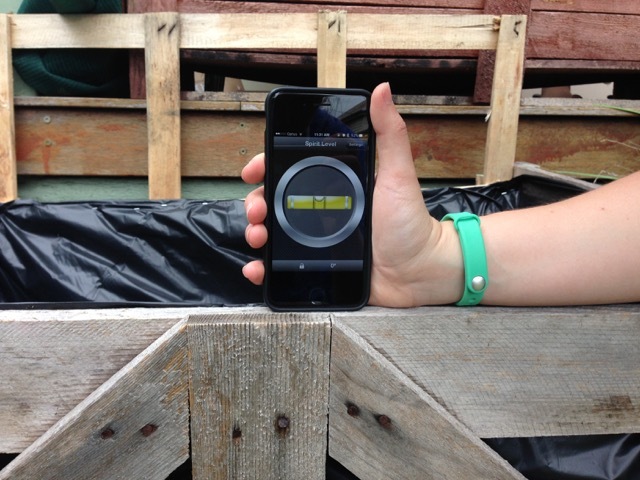 We also don’t have a real level, but were able to use an app on our phone to check. 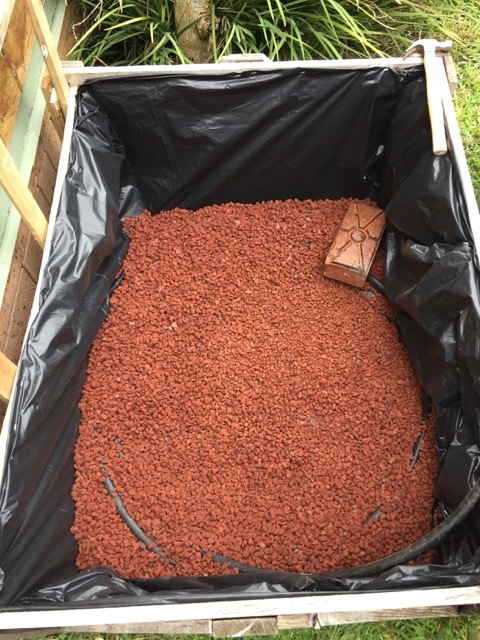 Pour in your gravel to thinly cover the base. Make sure to spread it out so you have a nice even cover. Use a nail and your hammer to tap holes throughout the piping. This will allow water to trickle out in all different spots. Place your tube in a spiral on top of the gravel. Make sure to leave enough for it to extend up and out of the garden bed. Cover the pipe with the rest of the gravel. You can use a brick or paver to hold down the lowest end. You should also cut a small drainage whole right above the gravel level that goes all the way to the outside. You could stick a tiny piece of piping through here to act as a drain. 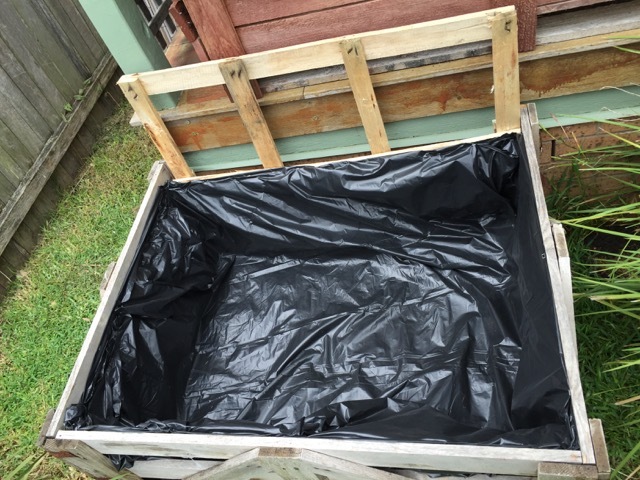 This allows the overflow water to run out instead of rotting the base of your soil. 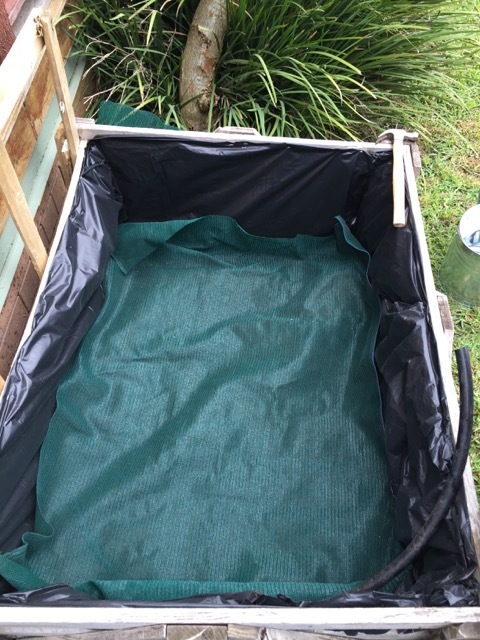 Cover the gravel layer with a piece of shade cloth. This keeps the soil seperate from your water bed, but allows water to pass through. Now’s the time to get dirty! Add in your soil. Make sure it’s high in organic matter as this is required for ‘wicking’ to occur. Make sure you don’t cover your water pipe! It should extend higher then the soil for easy filling. 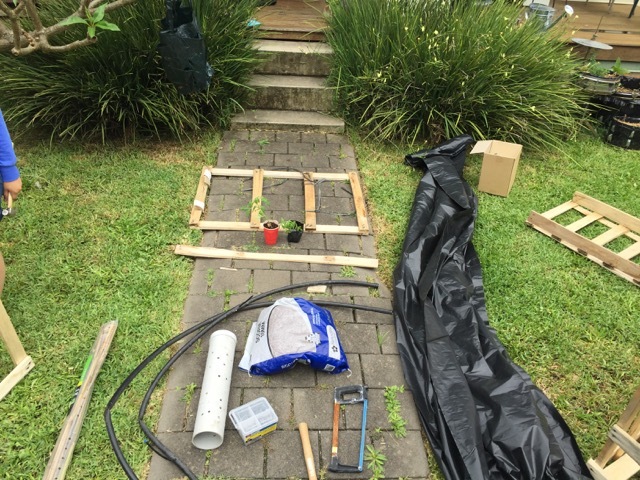 Add your DIY Worm Tower (see above for link). The Worm Tower is basically a worm restaurant. They wriggle in here through the holes to eat your compost then wriggle out throughout the garden spreading their wormy goodness all over your plant roots. Lay out your plants. 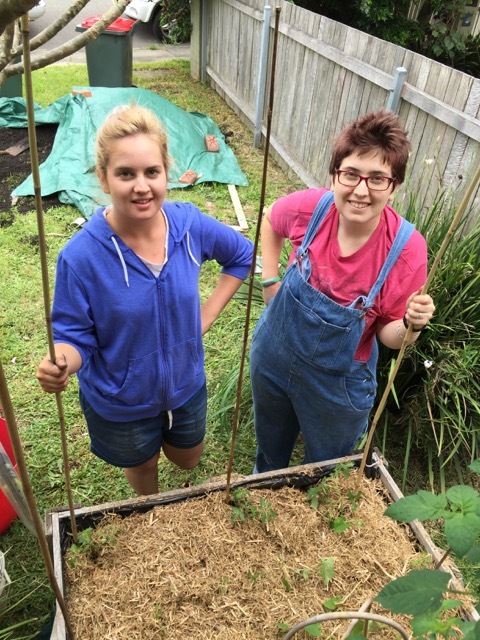 In my bed, we put tomatoes all around the outside, using bamboo for stakes. 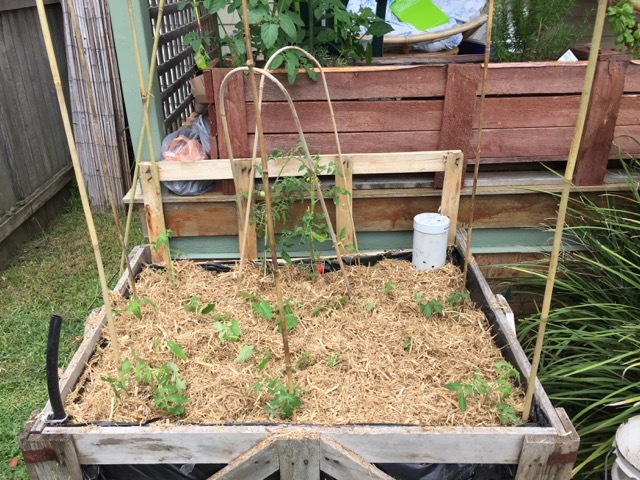 We also added two rows of Dwarf beans in the middle for a bit of variety. 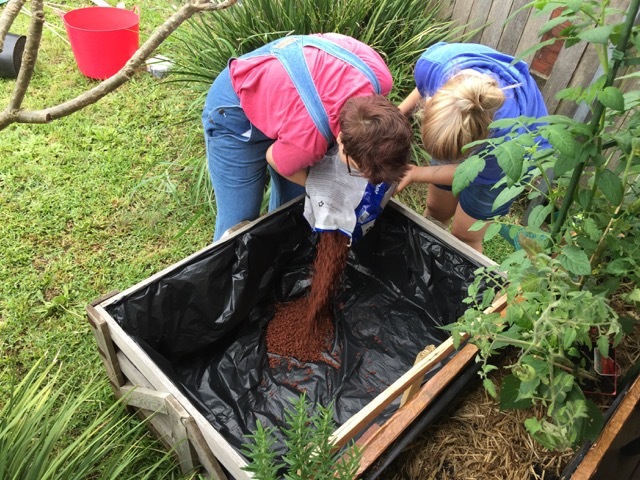 Cover your plants with sugar cane mulch to assist in the slow evaporation of water. 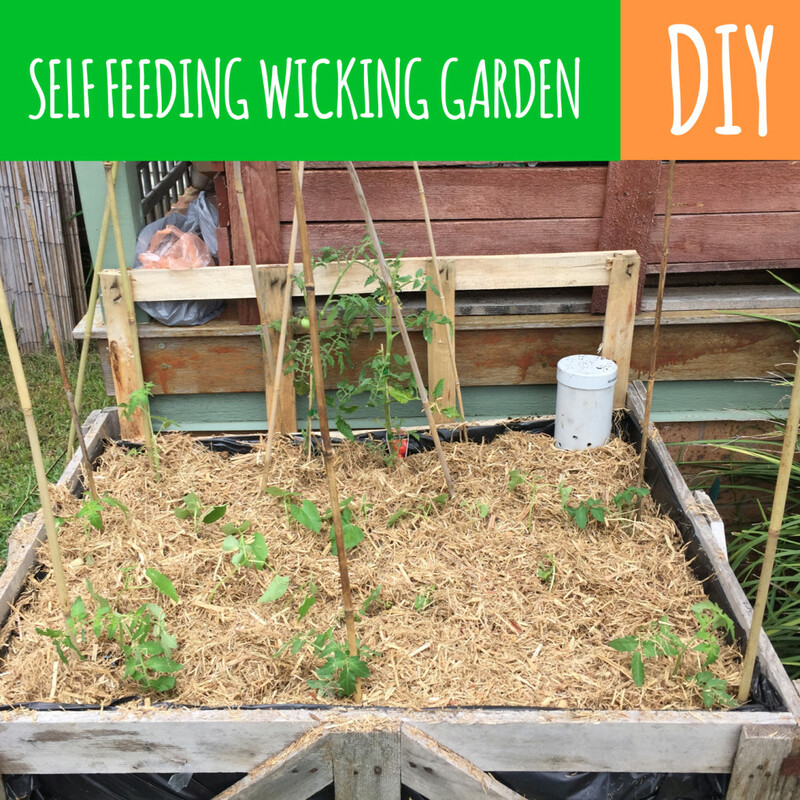 Water your plants top down (the normal way) for the first few weeks while your wicking bed gets ready for action. Monitor the soil dampness yourself to make a decision when to stop top down watering. 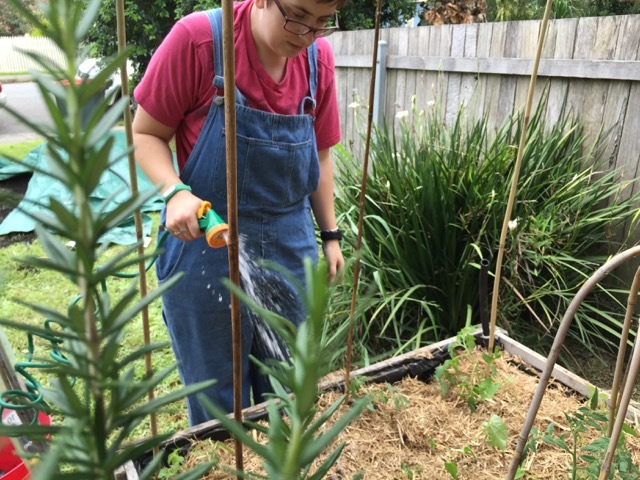 To water the wicking bed, simply add water to the open pipe until the water is at the top of the pipe. You could make a float to put in the pipe to see where your water is at. You will only need to add water, when the water levy is low. Here’s to wonderful produce from our self-feeding, self-watering tomato garden ! Thanks to guest handywoman Sarah and photographer Hannah!